Click here for a Roosevelt Forest trail map. The Forbidden Forest 30 Hour Trail Race will be held From June 26 to June 28. The trails will be open, however, all dogs must be on leash, and parking is VERY limited. Part of the proceeds will be going to the Roosevelt Forest Commission/Dog park and to the Stratford EMS. Thank you. Roosevelt Forest is a remarkable town-owned forest. 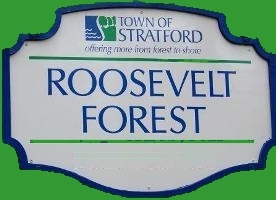 Roosevelt Forest is comprised of approximately 401 acres and is located in the northern section of Stratford abutting Shelton. is permitted at Roosevelt Forest. 1: From Stratford Town Hall proceed north on Main St.